Oris is one of the last big watch manufacturers that has been able to maintain its independence even after 100 years. The company exclusively produces mechanical watches that are known for their exceptional value for money. Oris occupies a special position among Swiss watch manufacturers. Its location in the German-speaking part of Switzerland sets it apart from the majority of other Swiss manufacturers, who tend to be based in the French-speaking part of the country. 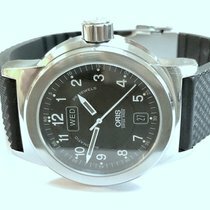 Oris is also one of the few manufacturers that is completely privately owned and has not become part of a large corporation. For decades the company has exclusively produced mechanical watches, and in 2014 it resumed the development and production of its own in-house calibers. 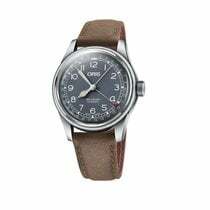 Oris watches are admired for their simple, functional design, along with their elegance and attractive value for money. This clear sense of structure is reflected in their product line, which consists of four collections: Diving, Aviation, Motorsport, and Culture. Watches like the ProDiver Pointer Moon and the Aquis Depth Gauge are popular among both professional and amateur divers. The same can be said for pilot's watches like the Big Crown ProPilot and the watches in the Motorsport collection. All of these timepieces offer well thought-out functions for their respective purposes. The classic-looking watches in the Culture collection are also a successful mixture of tradition and innovation. 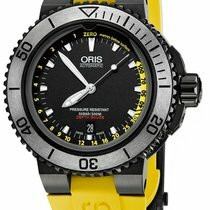 How much do Oris watches cost? 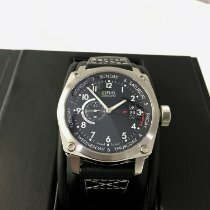 Oris has a reputation for offering top quality watches at very attractive prices. Pre-owned vintage models sell for as little as 100 euros, and current models are also reasonably priced. For example, a mint-condition Big Crown ProPilot Date can be bought for 900 euros. 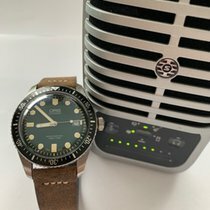 Prices for current versions of the Aquis Date diving watch sit at around 1,000 euros, and the iconic ChronOris Date is only slightly more expensive at around 1,150 euros. Plan to spend a bit more for models with complications like a chronograph function. For these watches, you can generally count on prices between about 2,000 and 3,500 euros. Watches with in-house calibers naturally lie at the upper end of this range, with a watch like the Artelier Calibre 111 selling for around 3,000 euros. Prices reach up over 13,000 euros for watches like the Artelier 110 Years Limited Edition, which boasts a red-gold case and the limited in-house movement 110. The tradition of producing pilot's watches at Oris dates back to 1910. In 1938 Oris introduced its Big Crown design, which gets its name from the oversized crown that is easy to use even when wearing pilot's gloves. The Oris Big Crown 1917 Limited Edition pays homage to the manufacturer's earlier pilot's watches and had a limited run of 1,917 pieces. The Oris automatic movement 732, which is based on the Sellita SW 200-1, ticks inside the 40-mm stainless steel case of this two-hand watch. A Big Crown 1917 Limited Edition will cost you about 1,800 euros. The 2014 Big Crown ProPilot Altimeter marks Oris's first automatic watch with an integrated, purely mechanical altimeter. This imposing 47-mm watch displays altitudes from 0 to 4,500 meters (14,500 feet) using a yellow scale around the edge of the dial while a red indicator shows the current air pressure. There are models with the altitude given in either meters or feet. The altimeter is activated using an additional crown at 4 o'clock. When the crown is screwed down, the altitude can no longer be measured; however, the watch then becomes water resistant up to 100 m (10 bar). The movement 733 based on the SW 200-1 operates inside this watch and includes a date display at 3 o'clock. A Big Crown ProPilot Altimeter costs about 2,600 euros when fitted with a textile strap and about 2,800 euros with a stainless steel bracelet. Oris diving watches enjoy widespread popularity, especially in Europe, with the Aquis Date leading the pack. Its stainless steel case can withstand depths of up to 300 m (30 bar), and it has a unidirectional rotating ceramic bezel. The hands and indices are coated in SuperLuminova, making them easy to read even in the darkest depths. The movement SW 200-1-based 733 powers this watch and displays the date at 6 o'clock. Cases are available in diameters of 43.5 mm and 36 mm. Regardless of which size you choose, you should set aside around 1,000 euros for an Aquis Date. The Aquis Date Diamonds was designed with women in mind. It is 36 mm in diameter and has 12 diamonds on the dial in place of indices. Prices for this watch hover around 1,400 euros. One of the most innovative diving watches to appear in recent years is the Aquis Depth Gauge, which also uses the movement 733. The 46-mm black stainless steel case is water resistant up to 500 m (50 bar). A unidirectional rotating bezel and SuperLuminova-coated hands and indices are also part of the package. One feature makes this watch particularly exceptional: A thin channel around the edge of the sapphire crystal functions as a depth gauge based on the Boyle-Mariotte law. As pressure increases while diving, the air inside the channel becomes more and more compressed, allowing water to gradually enter the channel through a small opening at 12 o'clock. The depth is then shown using a scale around the dial. This method of measuring depth had never been used in a mechanical watch before. One of these innovative watches can be yours for around 1,900 euros. As its name suggests, the Divers Sixty-Five is a modernized remake of the first Oris diving watch from 1965. Just like the original, the current version is water resistant up to 100 m (10 bar). The automatic movement 733 based on the SW 200-1 ticks inside this watch and provides it with a date display and a power reserve of 38 hours. This retro watch costs about 1,200 euros. Motorsport has been a pillar of Oris's product landscape since the early 1970s. In 2003, Oris even became an official partner of the Formula 1 team Williams. This collaboration resulted in the launch of a collection of watches bearing the Williams name in 2015. A highlight of the current collection are chronographs with carbon cases. A special patented method allows the 44-mm case to be constructed almost entirely from carbon; only the crown, pushers, the thin bezel, and the screw-down case back are made of coated titanium. Thanks to the use of carbon, these watches are both light and extremely robust. The ETA 7750-based Oris movement 674 is at work inside of them. You can buy an Oris Williams Chronograph Carbon Fibre Extreme for around 3,000 euros. The Oris Williams Valtteri Bottas Limited Edition, limited to 770 pieces and dedicated to the Formula 1 driver with the same name, costs around 3,500 euros. If you're more interested in a vintage look than a high-tech one, you should take a closer look at the ChronOris models. Chronographs from the 1970s inspired the design of the Oris Williams 40th Anniversary Limited Edition, released in commemoration of the racing team's 40th year. However, the positions of the 30-minute counter at 12 o'clock, the 12-hour counter at 6 o'clock, and the date display at 3 o'clock lend this watch a modern touch. The Oris movement 673 based on the ETA 7750 ticks inside the 40-mm stainless steel case and has a power reserve of 48 hours. Prices for this limited edition chronograph sit at just under 3,000 euros. Oris's Culture collection contains classic dress watches well suited to formal occasions. Fitting to its name, many watches in this collection take inspiration from jazz musicians like Louis Armstrong, Nat King Cole, and Herbie Hancock. For example, the Artelier Dexter Gordon Limited Edition is dedicated to the saxophonist Dexter Gordon and was limited to 1,000 pieces. This three-hand watch with a date display at 6 o'clock wins people over with its understated elegance. References to the saxophone can be found in the reed-shaped index at 12 and the brass second hand that contrasts nicely with the gray-brown dial. An Artelier Dexter Gordon Limited Edition can be yours for around 1,400 euros. The in-house movements 111, 112, and 113 also feature in the Artelier collection. All three are hand-wound calibers that are based on the limited caliber 110 from 2014. They all have a 10-day power reserve, which is displayed on the dial. Caliber 111 includes a small seconds dial and a date display, whereas caliber 112 has subdials for a second time zone and a moon phase. Caliber 113 displays the date, day of the week, calendar week, and month. You should plan to spend about 3,600 euros for an Artelier Calibre 111 with a stainless steel case. Prices for an Artelier Calibre 112 start around 4,650 euros. If you're looking for an Artelier Calibre 113, be sure to set aside around 4,400 euros. Oris's history begins in 1904 when Paul Cattin and Georges Christian took over the Lohner and Co. watch factory in the northern Swiss town of Hölstein. A nearby stream, the Orisbach, would become the company's namesake. 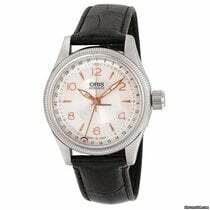 In the following decades, Oris became the largest employer in the town and had factories in a number of other locations until the late 1920s. For a time, it even operated a bus service to bring its employees to and from work. From the beginning, Oris has concentrated on making watches for special purposes. Aviators, divers, and motorsport racers quickly grew enthusiastic about the functional design and high quality of Oris watches. Together with culture, these categories remain pillars of the Oris product range to this day. During the Quartz Crisis at the beginning of the 1970s, Oris fell on hard times and became part of ASUAG, which would later become the Swatch group. In 1982, the company regained its independence, following a management buyout initiated by Dr. Rolf Portmann and Ulrich W. Herzog. The company remains independent to this day. One of the most important decisions made by the new company leadership was to produce only mechanical watches. 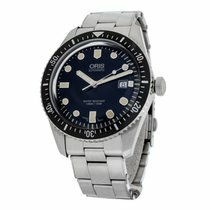 In the 1990s, "High-Mech" became Oris's slogan in response to the "high tech" trend at the time. Since 2002, the company's trademark Red Rotor has been the embodiment of this spirit and can be found in all of their automatic watches. To celebrate the company's 110-year anniversary in 2014, Oris resumed production of their own in-house movements after a 35-year hiatus. The movements, which have a power reserve of 10 days and incorporate sophisticated complications, are being gradually introduced into the company's collections.